Are police forces too white? The lack of diversity in policing has been a contentious debate topic in the aftermath of the Aug. 9 shooting of black teen Michael Brown by a white police officer in Ferguson, Mo. Ferguson, which had only three African American officers on a force of 53, is not a demographic rarity, and a month after the shooting, the Associated Press explores the trouble departments have in attracting minority applicants. Distrust of police runs deep in many minority communities, often because of incidents like the Brown shooting and the confrontational response by local police who teargassed protesters. Despite acknowledged challenges, recruitment efforts by departments are often seen as too narrow. Experts say many departments limit their searches too close to home, often don’t recruit in the right places and set criteria that can disproportionately exclude groups they hope to attract. And across the U.S., police are not just struggling to attract blacks and Hispanics, but members of immigrant groups where distrust and fear of authority run deep. Ferguson Police Chief Thomas Jackson said other black officers left the city for better-paying jobs, the story said. 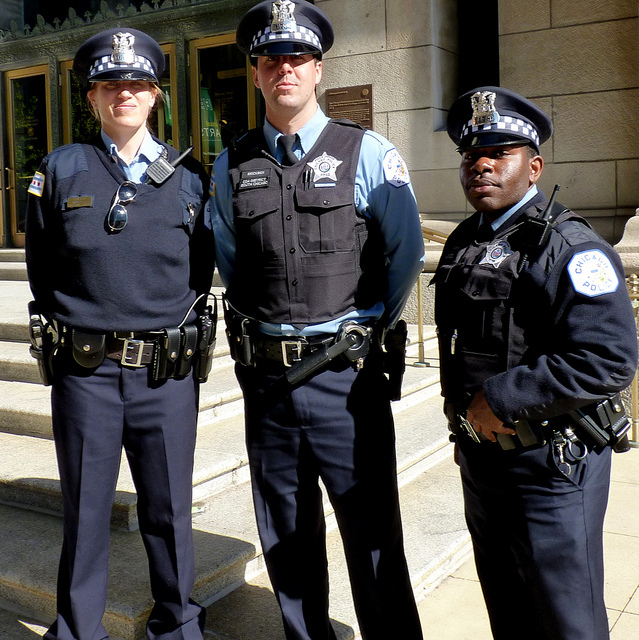 With few minorities attending police academies, agencies compete to hire them. Years back, Charles Henson, the first black president of the local Ferguson school board, suggested giving minority recruits a stipend to pay for academy training, the story said. Henson doubts the officials in Ferguson have done enough. Policing often isn’t an attractive profession in communities that see officers as antagonists who profile them, treat them disrespectfully and in the worst cases, beat or even kill them. The federal government acknowledges the challenges and has tried to help police boost their recruiting. “The underrepresentation of minorities and women police officers in some departments creates a shortage of role models for recruitment of these populations,” a 2009 Law Enforcement Recruitment Toolkit created by the Justice Department and the International Association of Chiefs of Police said. In Pittsburgh, diversity on the police force is decreasing. Between 2001 and 2012, 14 of the 368 officers hired were African American, as the Pittsburgh City Paper recently pointed out. In 1975, a federal judge had ordered the Bureau of Police to hire black and white officers equally. But that quota system was scrapped by another judge in 1991. Focused outreach by some departments has increased diversity. In North Carolina, for instance, the Charlotte-Mecklenburg police department recently hired several officers from Puerto Rico and has hired 25 Hispanic officers in the past two years, the AP story said. The department gives increased pay to officers who speak Spanish, Laotian or Vietnamese. Police in Minneapolis note the success of efforts to recruit east African officers to work in the city’s Somali community. But diversity, the story notes, does not necessarily mean better policing. Changes to make departments more diverse “have not curbed police violence in communities of color” or removed the special challenges of policing disadvantaged neighborhoods, wrote Malcolm Holmes and Brad Smith, co-authors of “Race and Police Brutality: Roots of an Urban Dilemma,” in a recent letter to the National Journal. And some departments say they aren’t worried about diversity – what they want are qualified candidates. Reach Jeffrey Benzing at 412-315-0265 or at jbenzing@publicsource.org.